Carcassonne and several of its expansions. Photo via wordsgoneby.blogspot.com. Scoville is on the ocean in a container on a massive vessel (info via latest KS update). That’s pretty sweet and it means that the time is rapidly approaching when all of the awesome Kickstarter backers will be able to get Scoville to the table! I couldn’t be more excited. So naturally I might as well begin work on an expansion (which I playtested last week!). Working on it has brought me to the question of “What is the purpose of an Expansion?” Today I’ll briefly try to address that. Throughout I’ll be using Carcassonne and Ticket to Ride as examples. Obviously the designer reasons and the publisher reasons that I provided are not nearly exhaustive, so take that however you want. I’ll only be covering the reasons for an expansion from the designer’s perspective. At the end I’ll also provide some things that an expansion SHOULD NOT do. REPLAYABILITY: When a game can be played over and over again without it feeling old and “samey” despite the setup and game conditions being identical. VARIABILITY: When a game presents different scenarios for play such that no two plays could ever be identical. Kingdom Builder – Variable Setup FTW! Those sound the same and they basically mean the same thing to me. The point is that I do not want to play a game the exact same way it was played prior. That turns the players into robots seeking to find the optimal plays in a game. I prefer games where it is different based on who you are playing with or how the game is designed. This can be accomplished in several ways but most often via randomness. Sometimes the original design doesn’t receive all the variability the game deserves. Other times the designer comes up with new ways to increase variability after the game is published. Either way, creating an expansion is a great way to bring the game to people’s tables again and make the experience better. Some of my favorite examples of expansions increasing the replayability/variability of a game are the Carcassonne expansions. (They actually meet all three “expansion” criteria I am mentioning today, so I’ll use this example for each below as well.) The Carcassonne expansions add replayability because they implement situations that are different based on the people you are playing with and based on the tiles you draw. But perhaps the best instance that I can think of for variability is with the random board setup and scoring conditions from Kingdom Builder. That is one of the most replayable and variable games in my collection and that doesn’t necessarily refer to the expansions. Add something new… like new routes to Ticket to Ride! Sometimes a game is deserving of a new addition that changes the game and how it is played. Adding something new to a game can make players want to play it again. It can be a new mechanic, new components, new cards, dice, etc. Adding something new doesn’t necessarily add depth. Adding new elements can simply make the game enjoyable to play again. In the Carcassonne world, the Inns and Cathedrals expansion did not really increase depth. Rather, by adding something new it lured gamers to play again and again. The Inns and Cathedrals addition is very minor but it adds enough to change the way people play the game. Another example is the USA 1910 expansion for Ticket to Ride. Basically it adds a bunch of routes without changing any rules. This is such a simple and smooth expansion to integrate with the base game. Designer’s should keep these sorts of additions in mind with creating expansions. An easy (actually ridiculously easy) way to expand Scoville is to design a whole bunch of new recipes that utilize previously unused combinations of peppers. This would add something new to the game without changing a single rule. Ironically I hadn’t thought of that until just now, while writing the article. I will be creating 20 new recipes! Grain, Beer, and Fruit by the Foot! Often an expansion will provide ways to make a game deeper strategically, tactically, or even thematically. This usually coincides with adding something new. A new mechanic can be added to the game that changes the gameplay or injects depth of decisions. Or perhaps new components are added that add depth via breadth (is that even possible?). I suppose that would be something like instead of limiting the game to four different resources, you could bump it to 6, which could add depth. In Carcassonne the Traders and Builders expansion adds notable depth. Players have the objectives of finishing castles such that they earn the bonus tokens of Grain, Beer, and Fruit by the Foot (or maybe grain, wine, and cloth… not sure). This sort of depth adds a distinct layer to the strategy players utilize during the game. Cost more than the base game (Though I suppose an argument could be made for certain situations). Change the base game so dramatically that it is a completely different thing. Detract from the original concept of the base game. Add an overwhelming number of new rules or exceptions to rules. So the simplest way to create an expansion is to simply add some new components like the Ticket to Ride USA 1910 expansion. That expansion did not cost more than the base game. It did not change the base game at all. It did not detract from the original concept. It added zero new rules. And it did not modify the rules. That’s a streamlined expansion. When expansions violate the 5 points I listed then they start to break away from what I consider an expansion and fall more in line with a whole new game. This would be akin to Ticket to Ride – Europe. The base game is the same but there are new components, new rules, and the original rules were modified enough that this doesn’t meet my criteria for an expansion. NOTE: Ticket to Ride – Europe was neither marketed nor sold as an expansion. So what do you think? What makes an expansion worthwhile to you? What are some of you favorite and least favorite expansions? Thanks for reading! I had meant to post a game design article last week but failed to find the time to write it. I’ll be posting that tomorrow instead. But today is Monday so it’s time to recap the Boards & Barley I’ve enjoyed over the last week. BARLEY SPOTLIGHT: No spotlight this week. 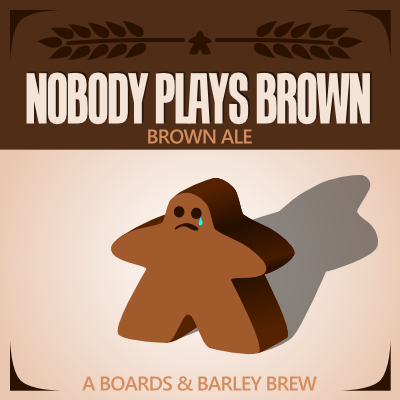 Nobody Plays Brown (Homebrew) – My “Choke it down” Brown ale. I recently designed a small expansion module for Scoville. I plan to design two or three more such modules. But I had the privilege to test it the other night. It was a lot of fun to work on Scoville again. The module adds another layer to the spatial element of the game, which is already awesome. There were a few interesting things that came from it and I’m pleased with how well it worked. A little tweaking and I might have to send it to TMG! Apparently I’ve been playing some games with my kids! This coming weekend I will be attending Protospiel-Madison. I will have the Scoville expansion with me and I am rapidly working toward having another prototype with me as well. It’s not Quantum Orcas, so breath your collective sigh about that. It’s a version of Armada Galactica that I think could have some potential. I still have a ways to go to get the prototype ready, but I think it could be a fun game. I’m also excited to see numerous game designers at the convention. It’ll be nice to see what people are working on. That’s it for the Monday Brews. What Boards & Barley have you been enjoying? Stay tuned tomorrow for a fresh game design article!